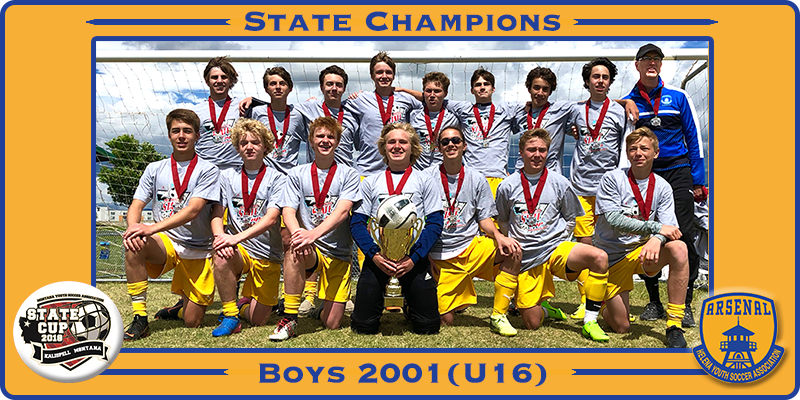 The Arsenal 2003 16U Boys Blue team coached by Zack Walder and Andy Adamek earned the title of State Champions winning the Gold Cup Division at the 2018 State Cup Tournament held in Kalispell on June 8-10. The team extended its unbeaten league play record into the state tournament by outscoring its opponents 10 - 2 through the final match against Bozeman Avalanche O2. Arsenal soundly defeated Flathead Valley United 02 Premier and Avalanche 02 in early play to avoid a play-in game before the final. In the final U16 Blue overpowered Avalanche with an attacking 3-5-2 formation in the first half and settled into a defensive posture during the second half to secure a 3-2 win, fending off a late game rally by Avalanche. Every single player contributed to the undefeated league play record and tournament outcome by winning their individual battles, moving off the ball, and playing with confidence and creativity. Players include Auggie Tupper, Ben Vince, Caleb Spencer, Caleb Hoxie, Aidan Adamek, Casey Fladager, Ethan Hayes, Ethan Peterson, Henry Lauerman, Jacob Demmons, Joshua Wilcox, Marston Carpenter, Russell Wells, Ryan Quin, Sam Lane and Zander Huff.